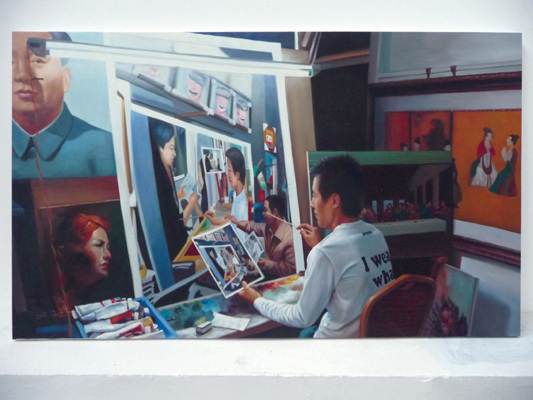 Chinese Whispers is an art project focused on forms of imitations and appropriatons. 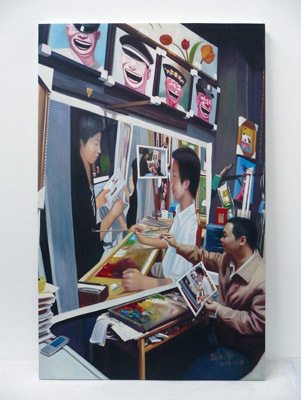 A series of paintings produced in cooperation with several Chinese replica painters reflects a shifting practice of originality and authorship while an affiliated film documents the process of translating and copying cultural commodities in a portrait producing economy. 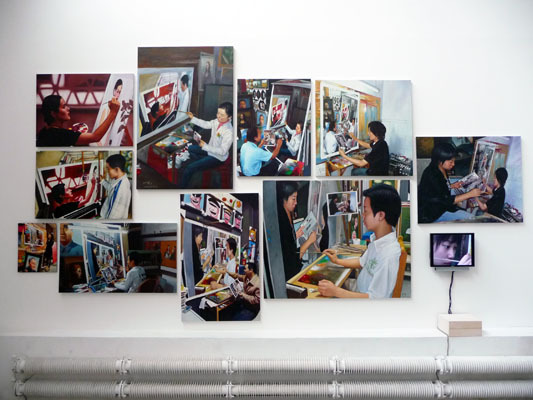 Within the project we analyze specific forms of production and reproduction by looking at the oil-painting industries of Dafen Village (Shenzhen). We focus mainly on the errors in translation and reproductions. By researching these errors, we want to make an artistic statement about cultural practice, identity and authenticity. Chinese whispers (also known as "Cadavre exquis") is the name of a children’s game. This game is about communication and its failures. A person whispers a word or sentence into the ear of the person next to them. This second person then whispers what he or she thinks the first person said into the ear of the next person, and so on. Each person changes the message a little. The original message is completely altered by the end of the whisper chain. This principle can be seen as ametaphor for for all kinds of communication systems. “Chinese Whisper” is therefore a good method to create unpredictable innovation. We used this “Chinese Whisper Method” for our project with the painters of Dafen. Geo-political context: The by now famous "Dafen painters village " is located in Shenzhen and therefore part of the Special Economic Zone (SEZ). The SEZ was originally established in 1979 due to its proximity to Hong Kong (by then a prosperous British colony). It was created to be an experimental ground of capitalism within "socialism with Chinese characteristics." Shenzhen: Shenzhen is now reputedly one of the fastest growing cities in the world. Being southern China's major financial center, it is home to the Shenzhen Stock Exchange as well as the headquarters of numerous high-tech companies. Shenzhen also is also home to the second busiest port in mainland China, with Shanghai being the first. It eventually became one of the largest cities in the Pearl River Delta region, which has become one of the economic powerhouses of China as well as the largest manufacturing base in the world. 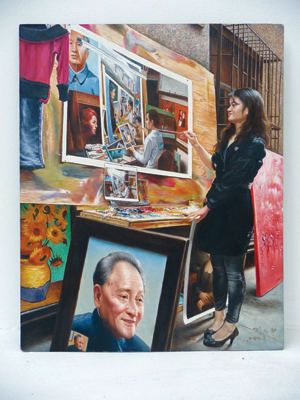 Dafen Village - The Copy Capital: Painters in Dafen produce exact replicas of historical and contemporary oil paintings. It has developed into an extremely profitable industry. 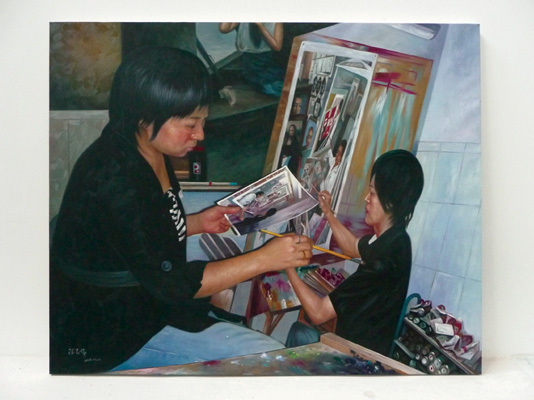 Approximately five million paintings are produced annually at "the assembly-line" – usually copies of masterpieces. 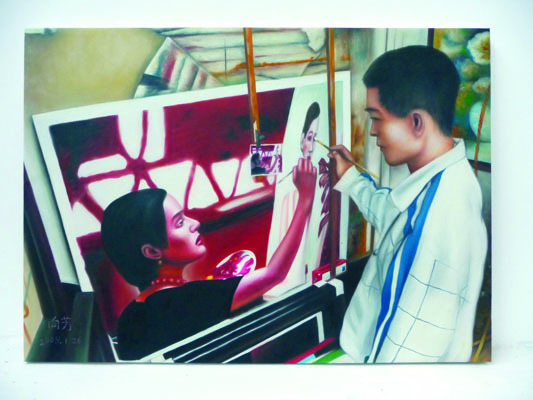 Many of the painters even specialize in specific styles (or masters). Major clients are western companies, such as hotels that want to impress with "classical" oil paintings but are unable (or unwilling) to afford originals. Good replicas fetch high prices and honors – in 2004, Dafen got the "Cultural Industry Model Base Award" from the Chinese Ministry of Culture. 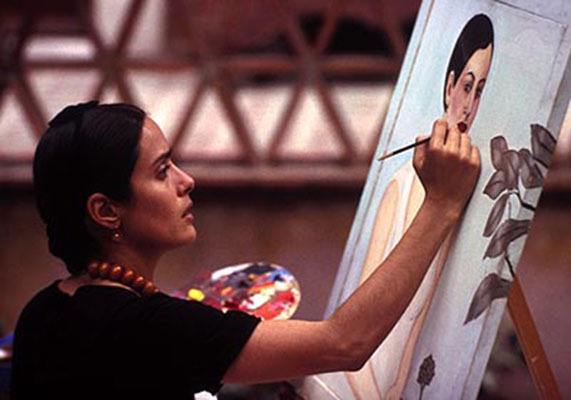 Painting the painter: Our starting point is a portrait, taken from a scene in the movie Frida, in which the actress Selma Hayek plays Frida Kahlo painting a self-portrait. We asked a painter to reproduce this picture in oil colors. 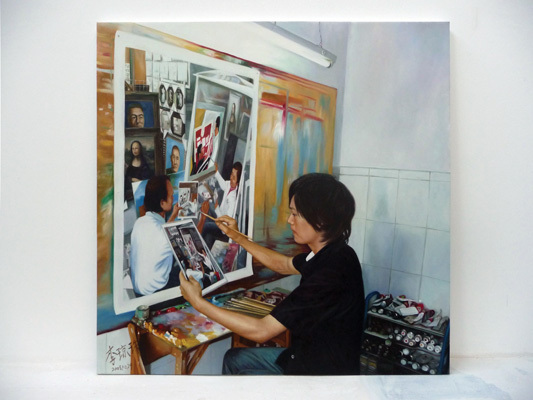 During the production, a photo was taken of the painter and his surroundings while painting the portrait. 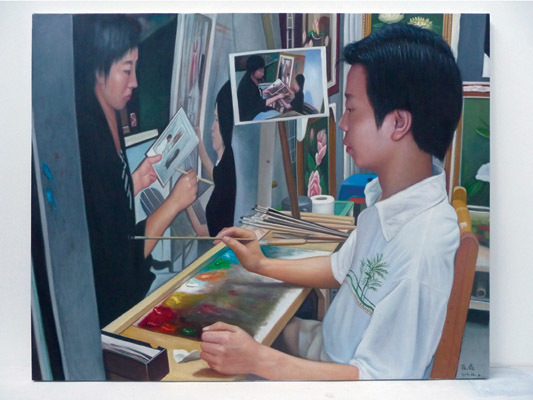 The photograph of this painter served as the start point for the next painter (with a different painting style). 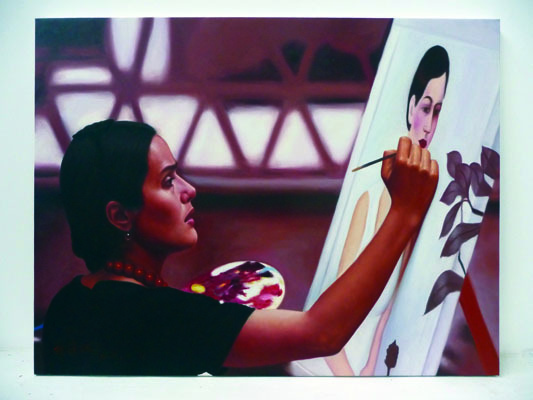 The motive of origin remains visible on the easel, but gradually recesses into the background as each successive painters make his or her modifications. 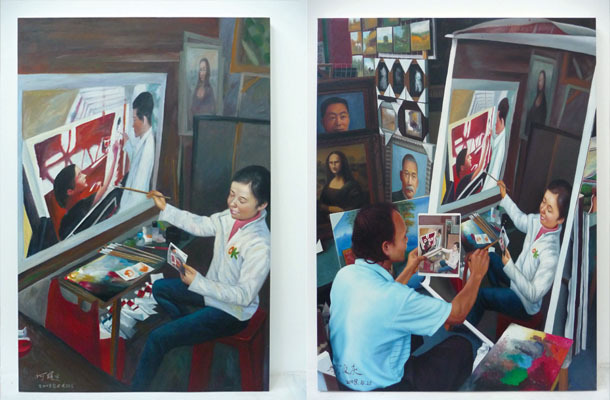 Several oil portraits are produced using this procedure, documenting the work conditions and circumstances of these "assembly-line" painters. Video essay: a subjective portrait of Dafen and its inhabitants. This movie shows the bizarre scenary of an oil painting factory implemented in a suburban village based on interviews with various characters involved in the process, such as painters, frame makers and agents. Set up: To provide multiple perspectives of this unique place we arrange the canvases together with a screen on which the film is shown.